These Slow Cooker Carnitas are easy to make at home with your crockpot. Popping them under the broiler at the end ensures that they get nice and crispy! If you’ve been following my blog for a while, you know that I’m a sucker for a good slow cooker recipe. I love the fact that I can do all the prep work the night before, turn the crockpot on in the morning and be welcomed home to a fully cooked meal. Gone are the days of the basic crockpot roast. Instead, let’s get reacquainted with the crockpot. Pull it out of the closet and try something new like this Butter Chicken, Osso Buco or Chicken Tortilla soup. 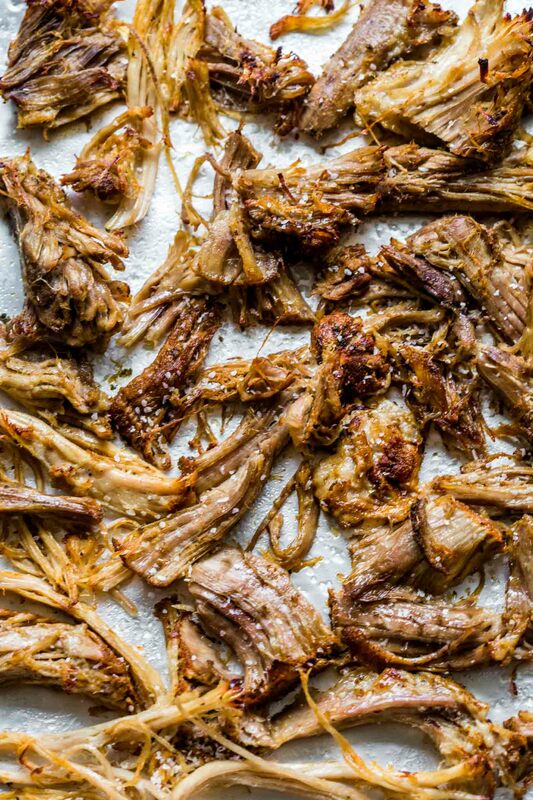 Or, how about these Slow Cooker Carnitas? They’re flavorful, crispy, salty and perfect for loading into street tacos. Street tacos are much different than the Americanized version found most often here in the states. Missing is the cheese, sour cream, and salsa. The main focus of these tacos is the meat. The meat being these amazing Slow Cooker Carnitas. 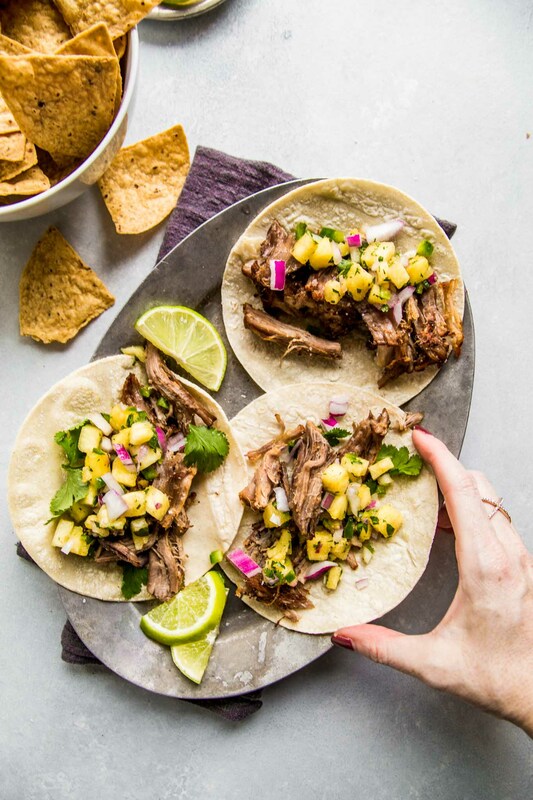 How Do You Make Slow Cooker Carnitas? The process of making these carnitas is super easy. 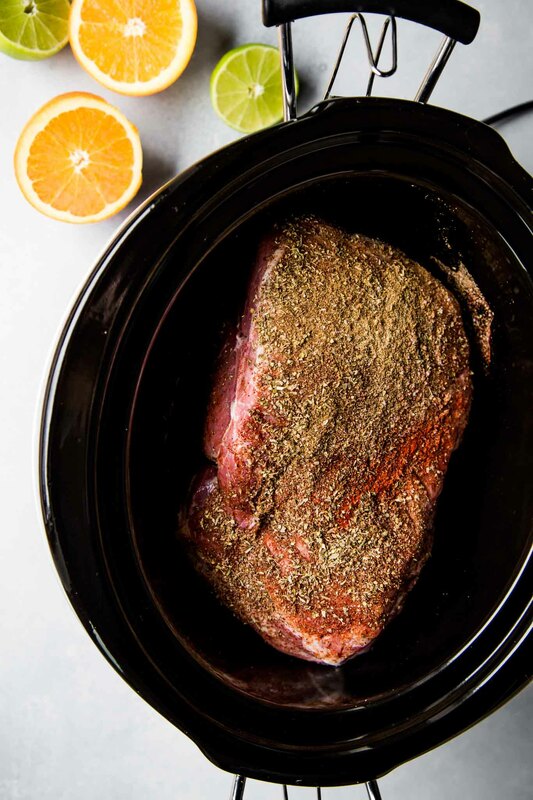 Just season a pork shoulder with a bunch of spices – chili powder, cumin, oregano – squeeze in some citrus juice – and let it cook away on low for 10-12 hours (or 5-6 hours on HIGH) until the meat is super tender and shreddable. How Do You Make Crispy Carnitas in the Crockpot? To make your slow cooker carnitas crispy, just pop them under the broiler with a sprinkle of salt when they’re done cooking. After a few minutes, they’ll become browned and slightly crisp and perfect. 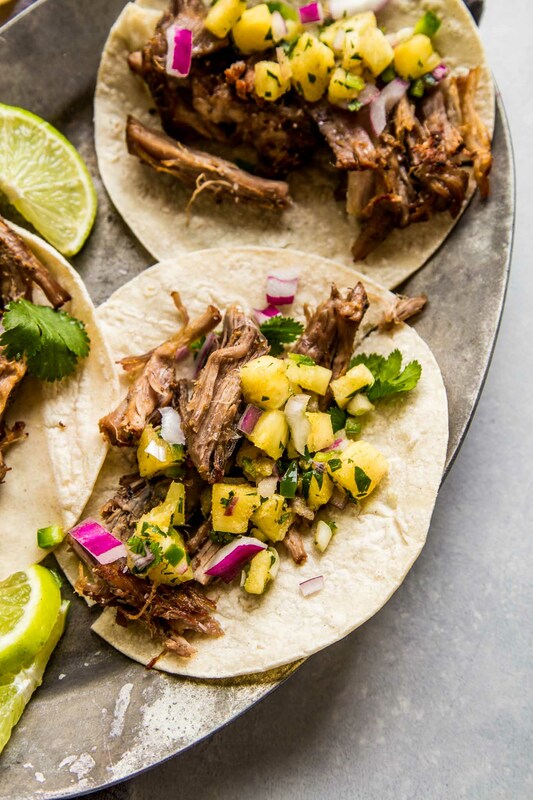 How Do You Make Slow Cooker Carnitas Street Tacos? To make these carnitas street tacos, I kept the toppings simple. I prefer to either top them with this Pineapple Salsa or with some cilantro, avocado and quick pickled onions. You can make those pretty pink pickled onions up to two weeks ahead of time. In truth, I normally have a jar in my fridge at all times. I’ve even got an entire post dedicated to how I pickle my onions. 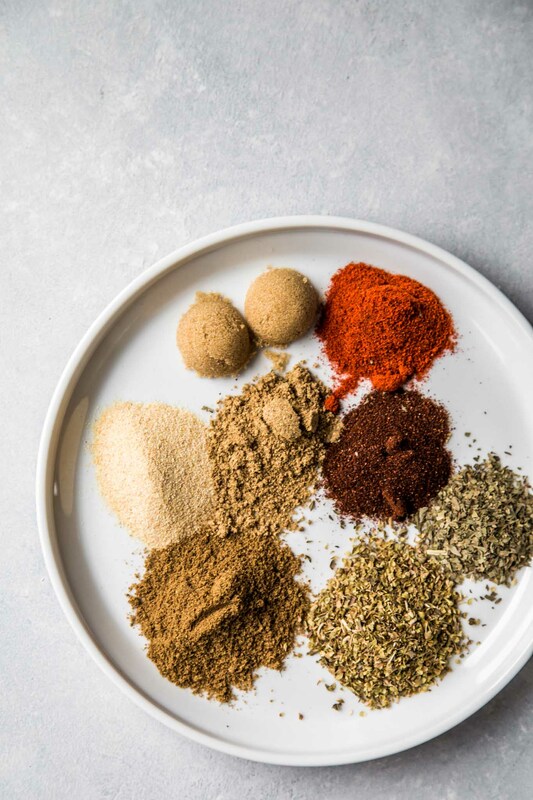 I love having them on hand for topping all kinds of things – Chicken Gyro Bowls, Instant Pot Split Pea Dal, even scrambled eggs. 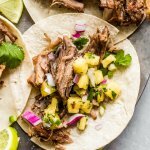 These Slow Cooker Carnitas Street Tacos are a delicious departure and I think you’ll really enjoy them! 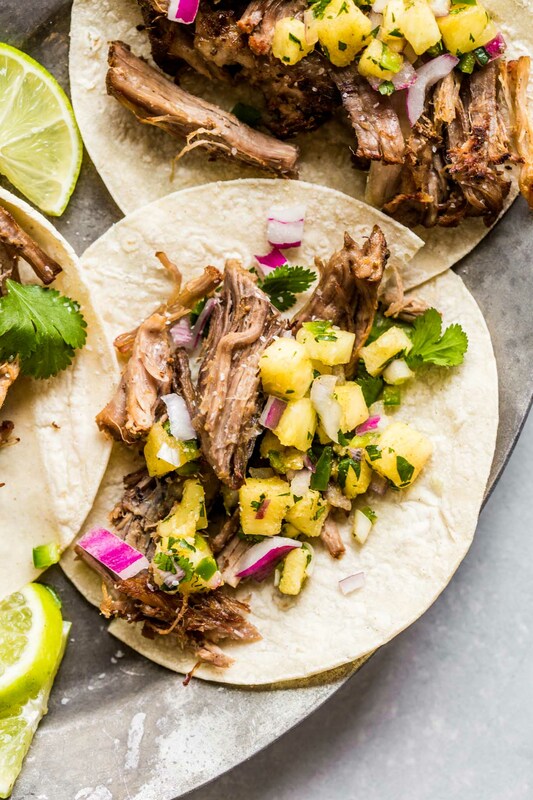 These Slow Cooker Carnitas Street Tacos are easy to make at home with your crockpot. Popping them under the broiler at the end ensures that they get nice and crispy! Add sliced onions to a medium bowl. Pour enough boiling water over them to fully cover and count to 10. Drain onions and place in jar or bowl. Heat vinegar, lime juice, 1/8 cup sugar, chili flakes and salt in small saucepan over medium heat until sugar has dissolved, about 3 minutes. If you loved these Slow Cooker Carnitas Street Tacos I would appreciate it so much if you would give this recipe a star review! Also, be sure to snap a picture of your finished carnitas tacos and share it with me on Instagram using the hashtag #platingsandpairings and tagging me @platingsandpairings. An authentic Mexican dish is always excellent with beer. I went with a classic Corona, but feel free to choose any light Mexican beer of your choice. If you’d like to pair these tacos with a bottle of wine, a Tempranillo would be an excellent choice for complimenting the spices in the meat. Margaritas – Try this one, this one, or this one. Leftover carnitas? Give these Carnitas Taco Bowls with Kimchi a try! I’ve been dreaming of having a taco party for several years. Now that I am back in the states. . .I think it is time. From the pickled onions to the pork. . .I love that everything is made ahead so that I can focus on other things vs running around cooking the day of the party. Love it!! Great idea for a party Lynn. I didn’t even think about how easy this would make things when you’re entertaining. Now you can enjoy your company and not be stuck in the kitchen! Have fun!!! Thank you so much for the recipe! I just made it for my family tonight and it was perfect! It was a crowd-pleaser and definitely a keeper. I’m looking forward to trying your other recipes. I’m so glad everyone loved it Jessica! It’s a favorite of mine and so easy! Question, when you put the pork in the slow cooker what liquid did you cook it in? Water, beer, ??? I know you added the juices from the fruit but what else was in the cooker. Thanks! 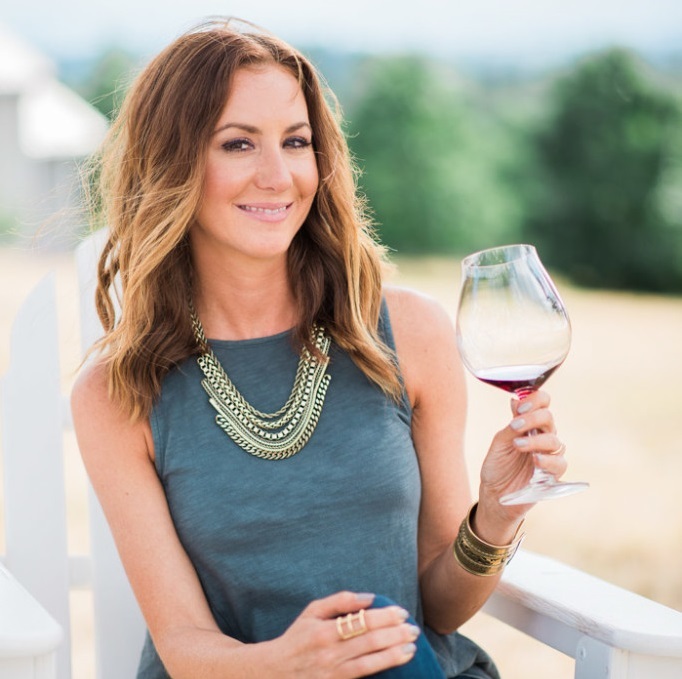 Hi Nicci – Surprisingly, no additional liquid is needed. The pork has so much natural fat in it that helps to keep it moist. Oh my yum! Made your recipe this weekend and we all loved it! Flavorful, but not too spicy. I followed your recipe except that I didn’t broil the meat in the oven — we were too hungry. We just ate the shredded meat from the slow cooker. This is moving into my “Favorite Recipes” board on Pinterest! Thank you for sharing it. Made these today. They were amazing.!! These really remind me of eating the tacos in Mexico. Delicious and authentic favors. So simple to make. Thank you for the recipe! I’m so glad you loved them Lynne! I am out of coriander ! Help! Need to make these carnitas tomorrow. Do I need it for this recipe? Hi Renee. You can definitely make this without the coriander. I would just add an extra pinch of cumin. Enjoy!!! I was wondering if you had tried this with a beef chuck roast? I may give that a try this week. Thanks for the recipe! Hi Karli – I’ve not yet tried this with a beef chuck roast, but I’ll be that it would be amazing as well! Or, here is my recipe for Slow Cooker Steak Carnitas Bowls – It’s also very easy and super tasty! You could swap the pork for the meat in that recipe. Can you use a boneless pork roast instead of bone in? It says total time is 1 hour 10 minutes. It takes 10-12 to cook. So total time is actually 11-12 hours. And prep only totoototook like 10 minutes, not an hour. When people are on a time crunch, this information is important. You’re right Emily – I just updated the recipe. Thanks! Odd question. What are the whitish/yellowish cubes in the tacos? They look like little cubes of potato? Hi Carol Ann – That’s the Pineapple Salsa.